For those aged over 21, our non-professional Actors Company perform classic, contemporary and new work commissioned by Royal & Derngate. Led by theatre practitioners, members enjoy masterclasses in performance skills such as voice, movement and text, as well as working alongside professional directors to devise, rehearse and perform productions in our performance spaces. The Actors Company also enables its members to develop their social and communication skills, gain confidence and make new friends. For more information, contact Erica Martin or call 01604 655732. Royal & Derngate Community Choir is the theatre’s resident choir, providing opportunities to develop singing skills and be part of pre-show performances and selected external events. The choir explores different musical genres reflecting the wide range of productions in the Royal & Derngate season. 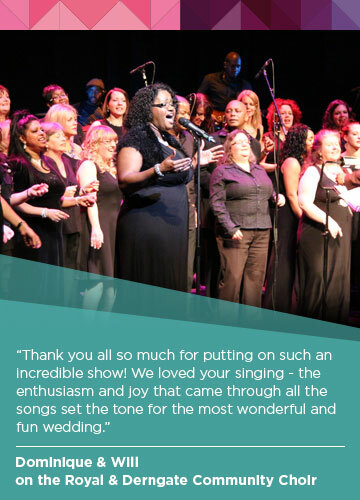 Members are diverse in terms of age, background and culture, but all share a passion for singing and performance. For more information, email Janet Gordon or call 01604 655733. Following the success of the theatre’s existing in-house choir, we are delighted to be starting this brand new singing experience for people who just want to sing. What does that mean? No audition process and you don’t have to be able to read music, in fact absolutely no singing experience required, all you need to do is turn up with the intentions of having fun, and our wonderful singing teachers will do the rest by pitching the sessions to appeal to all abilities. You are invited to come along on Wed 27 February to our free introduction workshop, where you can sign-up for the weekly singing sessions. The sessions will cost £6 a week, payable termly. To register please email Janet Gordon or call 01604 655733. Join us for three relaxed opportunities to chat about the play you have just seen while enjoying a cup of tea and a slice of cake. We may even receive a visit from the directors and actors of the productions. COST £22 per performance (includes ticket, tea and cake). Please book via Box Office on 01604 624811.